Jamestown Revival is a Critically Acclaimed Austin, TX Duo Made Up Of Jonathan Clay &Zach Chance Who Blend Literary Storytelling, Rock N Roll Grit, Indie Spirit, & Country Soul. They have performed At Festivals Including Coachella, Stagecoach, Austin City Limits, Bonnaroo, and Bottlerock Festival, Among Others. iTunes Crowned Utah The Best Of 2014: Singer-Songwriter Album Of The Year. On the new single, the duo notes, We had to reconcile with the fact that our next album needed to take on a life of its own. The result of this revelation came in the form of Love Is A Burden. At first listen, it sounds like a song about love. But for us, it s a song about the difficulty of letting the past go...Be it a relationship, a past accomplishment, or a regret, we realized that dwelling on the past was holding us back from the future. Love is a Burden is about letting go and looking ahead. 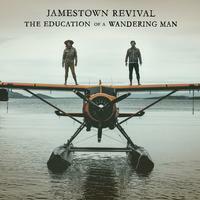 The song is the first to be released from the indie-Americana band s forthcoming sophomore album entitled The Education of A Wandering Man [Republic Records] due out later this fall.